Rajasthan is one of the most visited places in India. It’s famous for its rich cultural heritage, spectacular forts and monuments as well as some festivals we think you’ll love. Read on and discover our top 10 reasons to visit Rajasthan. Located just outside the city of Jaipur, this sprawling rock fortress protects spectacular palaces, halls and exquisite gardens. Enter through the Sun or Moon Gate and from the main courtyard. From here you can explore beautiful areas such as the Diwan-i-Am, the Ganesh Pol, Jai Mandir as well as Sukh Niwas. 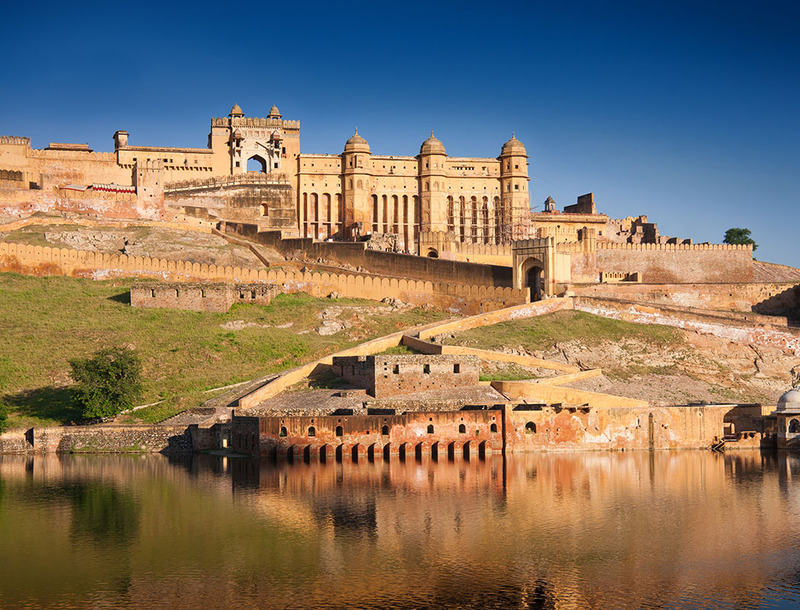 Boasting the most breathtaking architecture and immaculate detail wherever you look, the Amer Fort is a sight you simply can’t miss! Built in 1799, the Hawa Mahal is an incredible feat of Indian architecture. Also known as the “Palace of the Winds”, it was designed to allow the royal ladies of the time to peer out upon the goings-on in the street below. Featuring 953 windows and a small museum, this palace is intricately designed and visually stunning; ensure you make time to explore this icon of Jaipur. Located on the eastern banks of Lake Pichola, this palace complex is home to incredible palaces and gardens, halls and courtyards. See the Moti Mahal, which boasts an extravagant interior and the Sheesh Mahal, adorned almost entirely in mirrors. Also housed here is the Jagdish Temple, the biggest temple in Udaipur. With so many fascinating and beautiful buildings in one area, the Udaipur City Palace is a must-see! Welcoming the arrival of spring and celebrated in Udaipur, Mewar Festival is a lively and vibrant festival. Local markets and shops sell handmade crafts and souvenirs and are adorned with colourful decorations and lights. This festival is particularly important for women as it coincides with Ganguar; see them celebrate by dressing in the image of Gangaur and Isar. Witness the procession through the main streets of Udaipur and enjoy the numerous cultural activities, songs and dances on display. Junagarh Fort literally means “old fort”. This fort is one of the best maintained and spectacular strongholds left in India today. Constructed in Bikaner between 1588 and 1593, this mammoth fort has withstood countless attacks. With twenty successive rulers leaving their mark on this fort, it shows an incredible timeline of the exchange of power in India. Explore diverse and beautiful mahals, admire detailed frescoes and incredible architecture. Within the fort, view fascinating artefacts and artworks in the museum and galleries, all showcasing the captivating history of Bikaner. Mehrangarh is a stunning fort that sits atop a sheer cliff-face. Built in 1438, this fort is a great place to delve into the history of Jodhpur. Within the fort, explore temples, palaces and a museum that displays ancient relics, paintings and artefacts. Within the fort, also enjoy the opportunity to see incredible cultural displays and musical performances.